This is an old pattern which I got with a straw filled roller pillow. No annotations! It's Bedford, I think - bought in Cambridge which was on the edge of the Bedford lacing making area. I am NOT an expert on Beds lace! How are the cloth trails held together? There needs to be something going from one to its neighbour to stop the whole lace falling apart. Plaits? Wouldn't they indicate where? Or twisted pairs? Surely not one pair for every pin! And there are clusters of three holes next to the footside - fairly spaced out. Ground? A bit far apart. I can't think of a Beds device which needs three holes. By the way, I thought I'd posted this into the main area yesterday, but I can't see it today. Perhaps I forgot to click on Post! Or it's ended up somewhere else, or is there and my computer can't see it. If so, apologies for double posting. A separate discussion is more appropriate, anyway. Jo - It is definitely a Bedfordshire lace. 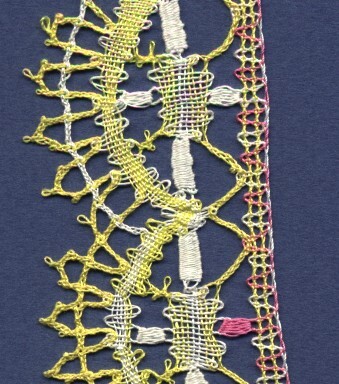 I found a very similar piece in Valerie Harris's THE LAVENDON COLLECTION OF BOBBIN LACE PATTERNS. Dryad, London, 1987. pages 69 and 70. I have been trying to scan it for you, but my scanner is giving me problems. In the meantime, here is the pattern. The photo will follow separately, when I figure out how to get the *#$* thing to work. just exactly where to feed pairs from one trail to another. Also look at Barbara Underwood INTRODUCING TRADITIONAL BEDFORDSHIRE LACE IN 20 LESSONS, Ruth Bean 1993. Plate 11 page 62. It is simpler than yours but has some of the same elements. A comparison might be useful.. Also see Fig 121 page 68 for how she handles the dense area between the repeats, where all the trails come together. Yes, I agree with Lorelei, - Beds pattern, but without the usual markings. They used plaits (legs) or tatties to jump between trails, usually , and legs to hold the footside onto a trail. They sometimes put square tallies instead of the plait for the bars in the 9 pin edge, too! Good luck with the talk and demonstration. Actually, that might be quite an interesting piece of lace when made up. Please show us how it turns out, afterwards. I would be very interested in seeing what you come up with. That's brilliant! Exactly right. Thank you so much! I do find it weird that they hadn't marked the tallies - you would have thought that would have helped in working it. Yes, I had worked out that I'd got the headside slightly wrong. It's far closer to a 9 pin than I thought. Actually my pattern is simpler, as it is only one pattern repeated, while yours has a flourish between the main patterns. But it's got the triple pin holes next to the footside. Oh dear - lots of tallies! Never mind. I shall construct a pattern of my own which is similar, I think. I am tempted to make the bit which I coloured blue into a bud instead. The pattern looks a bit like an eye to me, and that would give a pupil to the eye. I shall have some tallies of course. Good for me - lots of practise! Anyway, I shall play around with concepts, but your pattern and photo are wonderful, for showing what the pattern must be. Thank you again. But this first attempt has shown me why the initial pattern was unmarked. It means you could have various different designs just by altering what connected the bands of cloth stitch. This actually a fairly complex Beds pattern, you have done very well for someone without a lot of experience. I am more timid that you. However there is a problem area. In the image below I have surrounded the problem area in red. You have worked it in an atypical manner, for Beds. It looks like you used braids/plaits to connect the trails together. Most Beds workers would not make the connection at every pinhole, and would have used a "kiss" stitch. The 2 laces below have the kiss stitch in a green ring. The first is from my collection. The 2nd is a little learning strip I did many years ago from a pattern and instructions by Margaret Hamer. For a kiss stitch you take the weaver from each trail, twist each at least once (# of twists depends on how big the space is), cloth stitch, and tw again to match the tw before the cloth stitch. Then each weaver goes and re-enters the trail. Basically the 2 weavers change places. I have also seen designs where, instead of a kiss stitch, the lace maker makes a short fat rectangular tally -- a cucumber tally. Like this below. Your pattern is nice and regular. Well done. However I have some suggestions. In the blue area I would not take the edge plaits/braids all the way to the 2nd trail. I would make some of those connections kiss stitches or cucumber tallies. And your green bars also could be kiss stitches or cucumber tallies. Those solutions would be more in keeping with what is usually found in Bedfordshire lace. What books about Beds do you have? If we have some of the same I could point to illustrations. You have done very well, sorting out that pricking. Well done. This is an interesting discussion. A pattern can finish up in so many different ways - especially in Beds Lace. Yes, I'd worked this out for myself! Remember that I haven't much experience of Beds. My main aim was to reduce the amount of pairs, and I thought that if (in a way) I took the pair from the headside through the trail to "bounce off" the next trail, in those Vs (the ones that you're complaining about) this would help. It didn't! And it's rather messy as well. I'm designing a new pattern which is, I hope, more conventional, but also easier to work (hopefully). There are a couple of other changes I'm making - I'm taking off the picots in the "arms" of the bud. You can see I've done that in the second half of the pattern, I think it looks cleaner, and gosh, it made it quicker to work! There were pins everywhere, and those picots got entangled in them. I'm replacing the "half spider" next to the footside with a single plait - I think it looks cleaner. Re the kiss stitches - I think I won't. This is just personal. I feel that they would fill in the area between the trails too much (like my over-zealous use of plaits did!) I'm going to try a combination of plaits and tallies - as cucumber as I can manage, but tallies are still a learning curve for me. Hopefully they'll be easier with this new design, with less pins. I've enjoyed this exercise. I'm afraid this is my approach to lace - try a design from an engineering point of view (so to speak - how to get a pair from one place to another, and how to support the different parts of the lace). Then work it and see how it feels. And then say "THAT'S why they don't do it that way!" Mind you - I suspect that my new design still won't be traditional Beds!